This is a personal favorite. I first started experimenting with roasted cauliflower soup about two years ago, with a recipe in the November 2005 Cooking Light. I liked it, but thought it was missing something, and doctoring it up with some grated Parmesan didn’t help much. Still, it was worth pursuing, so I kept tinkering until I ended up with something with a more complex flavor. The wine makes a big difference, but of course this time around I left it out; it didn’t stop me from eating up the leftovers for lunches before the weekend was out. 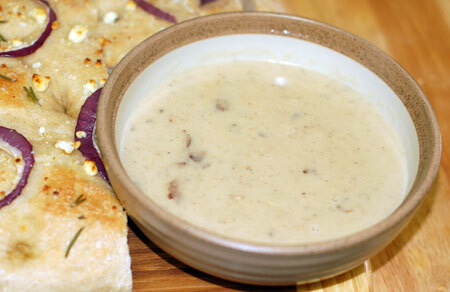 This is one of those soups that isn’t going to look good in photographs no matter how I try to gussy it up. I considered doing a creme fraiche swirl, but didn’t want to open up a new container just for a garnish. And I had many more Thanksgiving preparations to get on with at the time…so it looks how it looks, and tastes ever so much better. Preheat oven to 400F. Core the cauliflower and cut it into 1/4″ slices; toss with olive oil and season with salt and thyme. Arrange on a jelly roll pan coated with cooking spray or a silicone mat, and roast for 1 hour or until golden brown, stirring after 30 minutes. Meanwhile, in a large stockpot, heat a tablespoon of olive oil and saute onion until soft. Add garlic and saute for 1 or 2 minutes more. Deglaze pan with wine and simmer until reduced by half. Add roasted cauliflower (reserving 1/2 C cauliflower pieces) and chicken stock; bring to a boil. Reduce heat and add the diced potato; let simmer until the potato is soft, about 20 minutes. 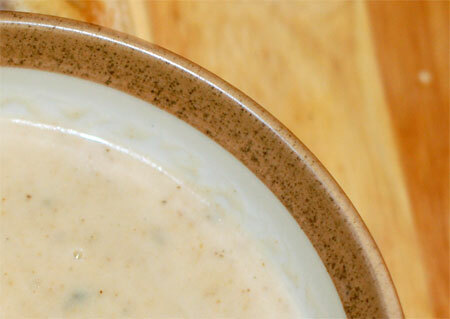 With an immersion blender, puree the soup and return to heat. Stir in reserved cauliflower and cream. Heat through, adjust seasonings and serve. I’m a member of the Daring Kitchen and would love to talk to you about a Food Talk article I’m working on. Please contact me by email and I’ll send the details. THANKS! 20 years ago, I tasted one of the most incredible soups (and certainly most expensive, at $9) I’d ever had; I knew it was full of calories from cream ; I tried to analyze its seductive flavor and have since attempted to duplicate that, while lightening it up. I concluded that the following flavor ingredients are key: wine, garlic, onion, and a bit of nutmeg. I add creaminess with a variety and usually a combination of lower-fat dairy products, including reduced-fat milk, non-fat dry milk and lowfat buttermilk,(stirred in at the end–don’t allow to boil afterward!) Sometimes I use chicken stock, sometimes I stir in (gasp!) reduced-fat Velveeta for rich, creamy flavor. Another nice variation is to add some cumin or curry powder, which provides intensity of flavor without calories. So do go ahead and “play with your food” to come up with your unique variation as Julie did to create this one!